10 Awesome Events for This Week! Bushwick, embrace yourself for jingles, Christmas trees, carols and awesomely tacky lights that every proper Bushwick house hold should have installed by now! Holidays are around the corner and that means an influx of holiday parties, craft markets and whiskey blended egg nog. Yum! Before we indulge ourselves in the seasonally festive atmosphere, let's take a look at the coolest cultural and art events happening in the hood this week! As we get older the toy objects we crave change, but the desire for the toys remain strong. New art show at Parallel Art Space (17-17 Troutman) explores the concept of the toy and how it changes as we move into different stages of life. Sounds like a fun night to us! Et al Projects, a gallery at 56 Bogart invites you to the solo show of painter Devon Dunhill Clapp on Friday evening. In the work and imagery of Dunhill Clapp one recognizes taboo and kitsch, indiscretion and language, death and sensuality. Clapp explores "the fetishized natural world, where dualities at first seem contradictory but on careful examination they are revealed to have parallel affects." Outpost Artists Resources in Ridgewood have teamed up with Ghana ThinkTank for a series of workshops and events focused on solving the "American Problems." The think tank analyzes problems collected in the first world and proposes solutions. The solutions are put back in the community where the problems originated whether the proposals seem impractical and others are brilliant. The first workshop is taking place this Friday and the series will continue through December 14. I think that we will all agree that Bushwick has almost all kinds of fun activities. The only thing we might have been missing is a proper karaoke night. 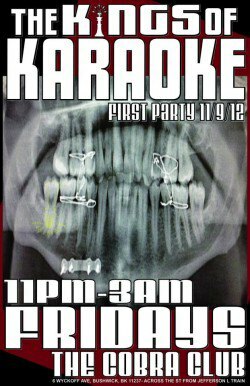 But luckily for a karaoke fix you can now head to Cobra Club every Friday night. Dance, squeal and squeek with Sarah Booz & Esquire. 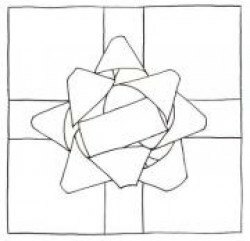 ...and finally a holiday sale of prints and jewelry! On Saturday, after brunch, head to Forth Estate Studio on 272 Morgan Ave. Oh, there will be a printmaking workshop as well! Curator David Gibson claims that when looking at any work of art, we at first have to render it as real, and then as beautiful, or at least useful. He will explore this proposition through a group art show titled The Quantum Effect. Head to The Active Space at 566 Johnson. We admire Studio 10 and the taste with which they handle their programming. On Friday they are hosting another installment of the Brooklyn Poets Reading Series. 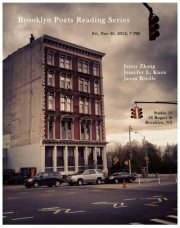 Join them for the night with poets Jenny Zhang, Jennifer L. Knox and Jason Bredle. Another sale this weekend that allows us to shop for locally crafted holiday gifts! 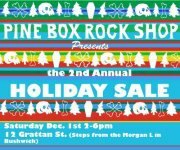 One of our fav bars Pine Box Rock Shop is hosting a holiday sale promising jewelry, cards, knitwear, terrariums, screen printed t's and all manner of fantastic gifts. You have a gallery opening on Saturday. Yes, you! The Living Gallery at The Loom, known for their original events is organizing another BYO Artwork event! Everybody is invited to join a big party and an installation at the same time. It is easy; bring your art, pay $10 submission fee (to keep the gallery living), hang it and have fun!